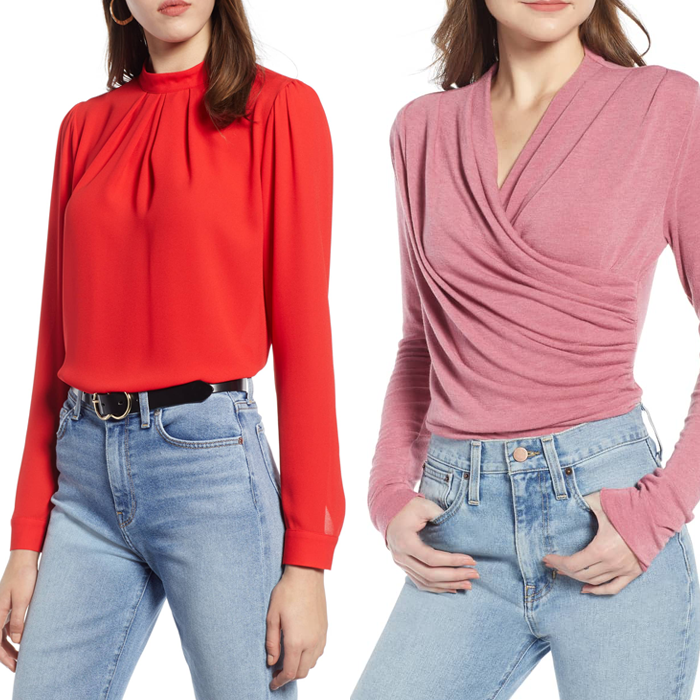 I find the boatneck (or ballet neck) to be one of the most flattering necklines for me. Recently, it has become more popular with Meghan Markle and her boatneck dresses, including her wedding gown. A boatneck helps to balance out the shoulder-to-hip ratio. 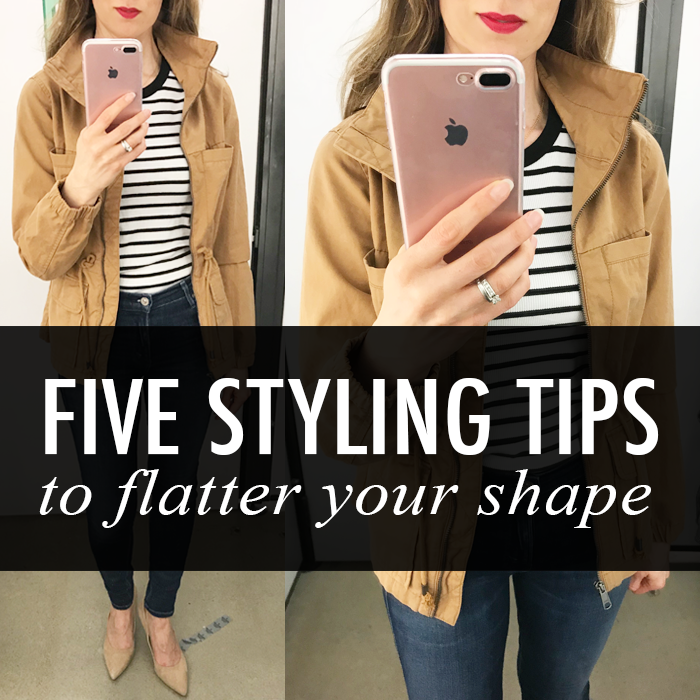 Since I have a smaller shoulder width compared to my hips, the wideness at the neckline, helps to balance out my hips and flatters my shape. Depending on your body shape - this guide helps determine which neckline works best for your shape. As my two examples here - boatnecks do not need to be extreme - they can be more subtle. I have really become very conscious of the rise of the jeans I buy. I have shorter legs, so a low rise jean makes my legs even shorter. The higher the rise of the jean - the longer legs my legs appear to be; however, I do not however go for the extreme high rise. I think those can be somewhat unflattering from the backside. I am wearing the medium wash high rise jeans. The rise of the jeans is perfect - not too high or low. For the longest time, I wore all my shirts untucked and out. I am so happy this trend of tucking things in is popular right now. By tucking in a shirt, it gives the illusion of longer legs. If I am wearing a long untucked shirt - it makes my torso look even longer - and my legs appear shorter. 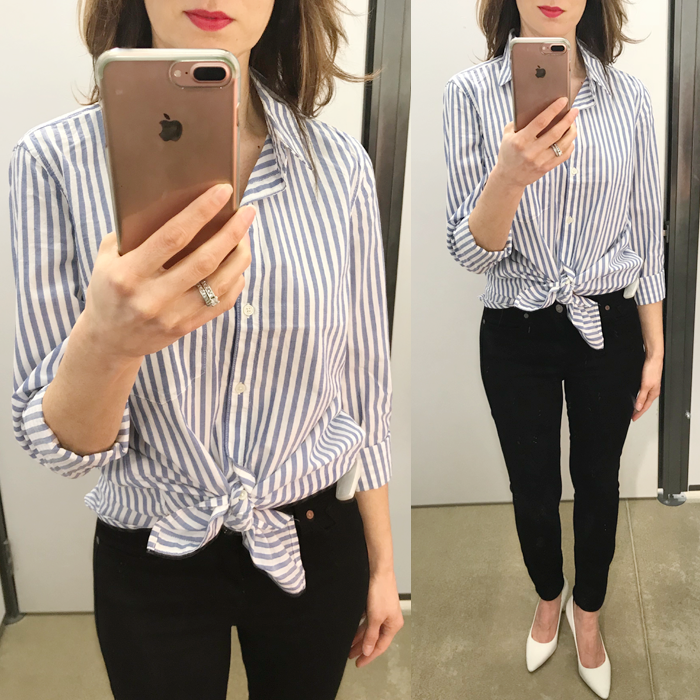 As an alternative to tucking in a shirt, you can always wear the shirt knotted (like I did below with the striped shirt). By knotting a tee or blouse, it defines the waist and also adds an accent to the waist, similar to wearing a belt. Since I have shorter legs and a longer torso, a longer top is not as flattering on me. I have a smaller upper frame - so sometimes a longer top can overwhelm my look. I try to stick with shorter sweaters. I find them to actually be more flattering. 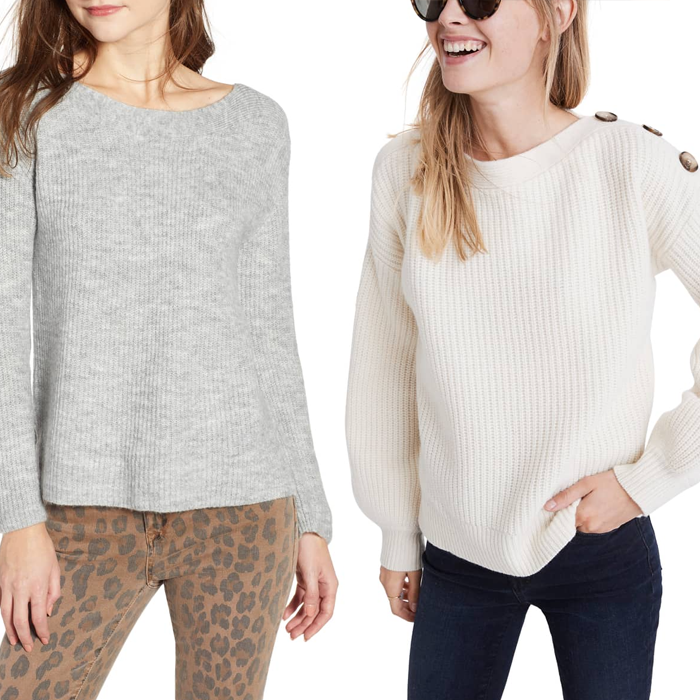 Sometimes we think we need to cover up more, but a shorter sweater can actually define our shape and be more flattering. Just because the sweater is shorter - it does not need to be extremely fitted. 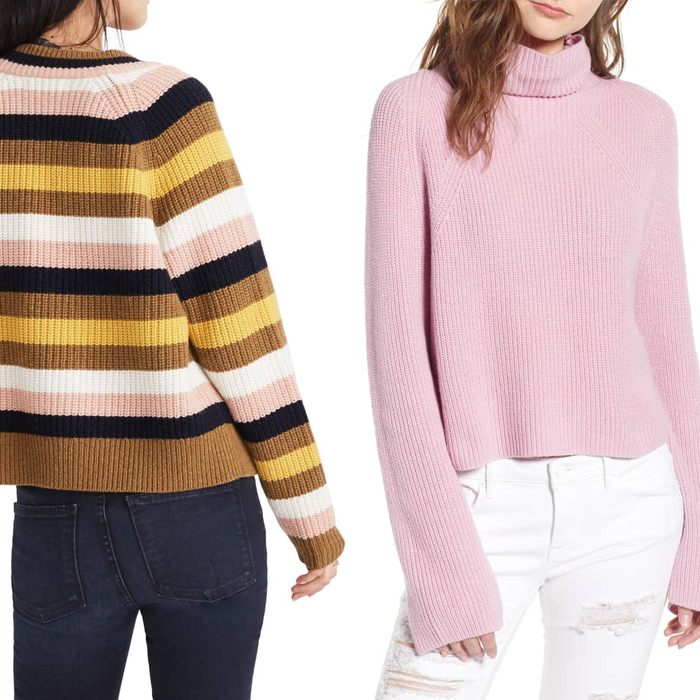 Depending on the style, a looser yet shorter sweater like the ones below are flattering - and may be an easier way of easing into wearing a shorter sweater. We mostly think of a taller heel height for being more flattering by extending our legs. This is true; however, the style of boot can also make a big difference. 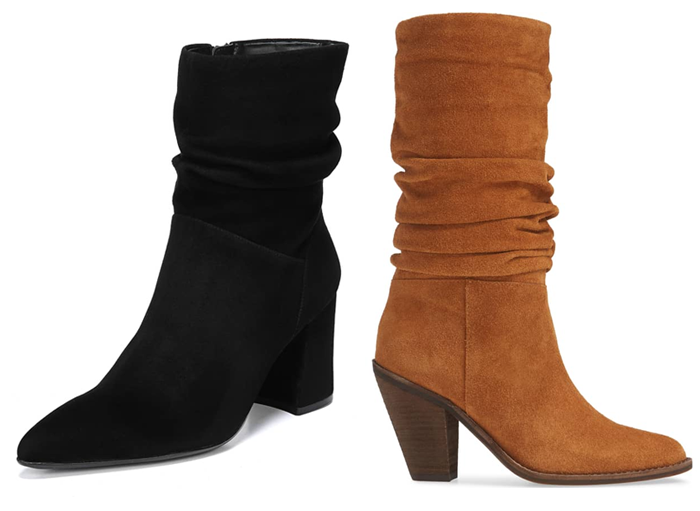 I have found slouchy boots to be very flattering. The extra “slouch” on the boot - adds weight to the lower leg, balancing out the hips and slimming the legs. This plaid parka with a fur trimmed hood is 60% off. This plush pink throw blanket (also in other colors) is on sale for $20. I like these black and gold sneakers. This orange and blue plaid shirt (also in other colors) is only $18. This fuzzy heart pillow is on sale for $20 - in pink peach and ivory. This is the cutest mini fridge and its only $30. These coral pink sneakers - on sale! These pumps are 60% off. These socks say exactly how a lot of of feel most weekends. This boiled wool wrap jacket is 40% off. This cozy fleece jacket is 50% off - and comes in both black and cream. 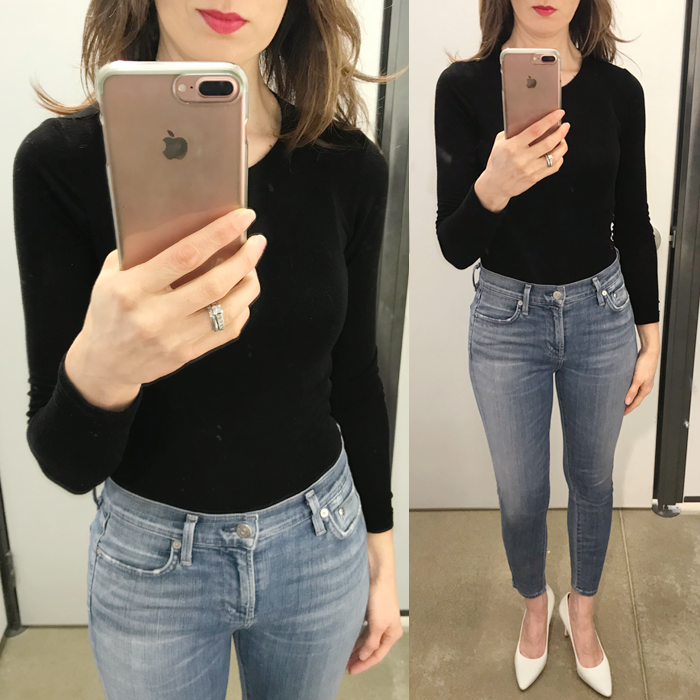 Just in case you missed it - I shared five ways to style black jeans yesterday HERE. 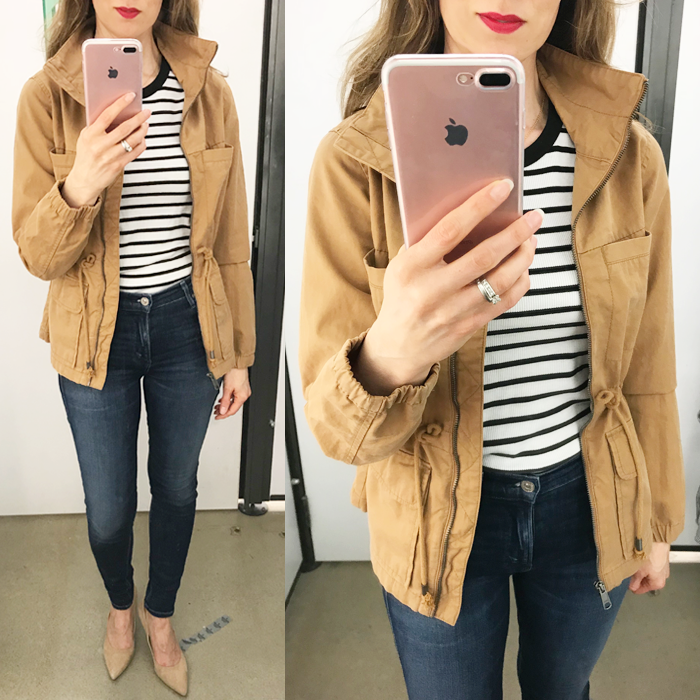 Also, be sure to join my friend Abbey and The Blended Blog women to link up your fashion post. Adore that jacket. I too love a top tied at the waist. Those medium wash jeans are such a fab fit, I may have to try those. Have a great day! Great tips! I look best in a v-neck because of my chest. Took me so long to realize that. I think once you know your body it makes shopping a bit easier! It's so funny that you mentioned to tuck or not to tuck! I actually meant to try styling my sweater with a sort of half tuck, but completely forgot! My photographer was not in the best mood because I had woken him up from his Sunday afternoon nap! Ha! These are helpful tips! 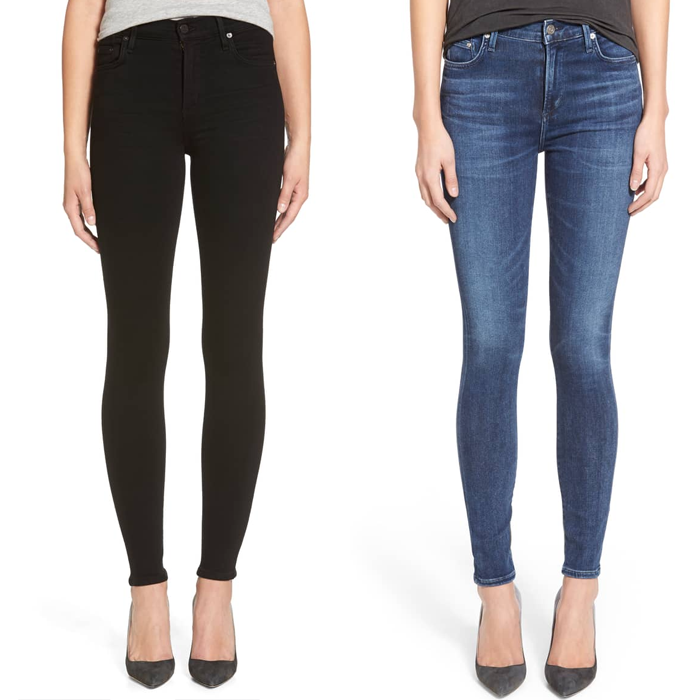 The rise of your jeans can really make a difference on how long your legs look! I am really loving this week's theme! It's been very fun and interesting to read everyone's posts and tips on what flatters and how to figure out what flatters! I'm relieved that you said slouchy boots are flattering because I have been all over them this year! LOL! I wish we lived closer together- I'd love for you to come boss me around and dress me.